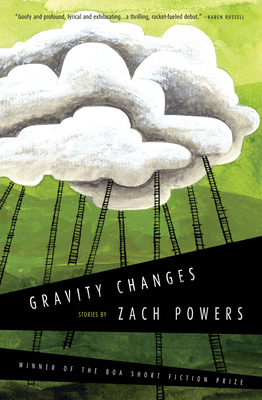 Gravity Changes is a collection of fantastical, off-beat stories that view the quotidian world through the lens of the absurd. Set in a surreal, fictional world that is populated by strange, fascinating characters--children who defy gravity, a man who marries a light bulb, the Devil and his ex-wife--these stories take wide steps outside of reality, finding new ways to illuminate truth. Zach Powers lives and writes in Savannah, Georgia. The co-founder of the literary arts nonprofit Seersucker Live, his promotional writing for television has won an Emmy Award, and he is currently a columnist for Savannah Morning News. Zach Powers lives and writes in Savannah, Georgia. Winner of the BOA Short Fiction Prize, his work has appeared in Black Warrior Review, Forklift, Ohio, PANK, Caketrain, and elsewhere. He is the co-founder of the literary arts nonprofit Seersucker Live, and leads the writers' workshop at the Flannery O'Connor Childhood Home, where he also served on the board of directors. His promotional writing for television won an Emmy, and he is a former columnist for Savannah Morning News.